Quilters Dream Batting is an excellent batting in multiple fiber contents, lofts, colors and sizes. Quilters Dream Batting is made here in the USA. The fiber contents are listed in the chart, as are the standard sizes and prices. The two loft sizes you will see listed in the chart are the request loft which is the thinnest, and the select loft which is a midloft. 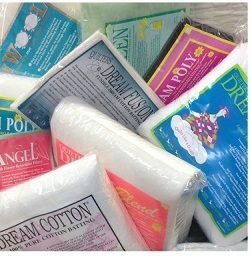 The Quilters Dream 80/20 Cotton/Polyester Blend batting comes only in a select - midloft. Wool is also one loft available, it is light yet lofty.